Knowing what to look out for when choosing an executive office suite or shared office space can save you thousands of dollars. We can help you with what questions to ask. Look: Before considering any executive office suite or shared office space provider, do an internet search of the name of the provider followed by the word “complaints”. Look to see if there is a pattern of complaints about the provider before choosing them. I can't emphasize this enough: Check to see if there is a fee associated with the break room, furniture, internet, phones, meeting rooms, copier & mail/shipping service. These fees can add up. Check to make sure there are no other hidden fees. For instance, provider require you to use their services after the office agreement ends? Some providers hide this language in their contract. Does the provider require that your office be painted after the agreement ends even if you took good care of the office? You may get a surprise when your security deposit is partially returned because fees are deducted that you didn’t know about. Make sure when your agreement ends that you will not be required to pay for other services you don’t want or need and make sure that you will not have to pay for office painting if it does not need it. Here's the deal: Make sure you are comfortable with the term of the agreement. Many executive office suite & shared office space providers offer 1 month to year or longer terms. They typically incentivize longer terms. Ask them what their incentive is for a longer term. Just make sure the term meets your needs. An executive office suite agreement is a binding agreement. Also, keep in mind most executive office suite agreements auto renew unless written notice is provided. Make sure you understand what notice is required to end the agreement. Bottom line: Make sure the location of the executive office suite or shared office space makes sense for your business. Also, make sure the business center has the look and feel that will work for your business. Take a close look that the reception area, office, conference rooms, bathroom and break room to make sure they meet your requirements. Lastly, If you need live phone answering or a phone in the office Peachtree Offices provides high quality VOIP phones. If you are considering an executive suite or shared office space in Atlanta, please visit Peachtree Offices. 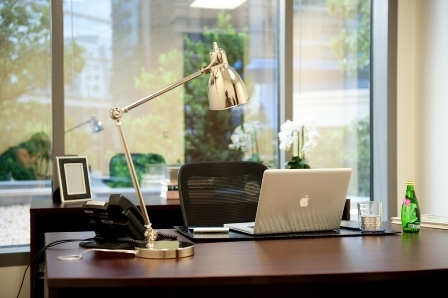 With locations in Buckhead, Midtown Atlanta, Downtown Atlanta and Perimeter, we can help you find the perfect executive office suite for your business.